Before you hit the back button or scroll down just to see pictures, take a minute to hear my story and share the passion for this amazing retarded sport I love. Grab some popcorn and sit back for the tears and joys of this journey. My name is Stu Kelly I am 21 and have been drifting for 3 years and building this car for 4...in those three years I have met some great friends, and had some awesome rivalries along the way. 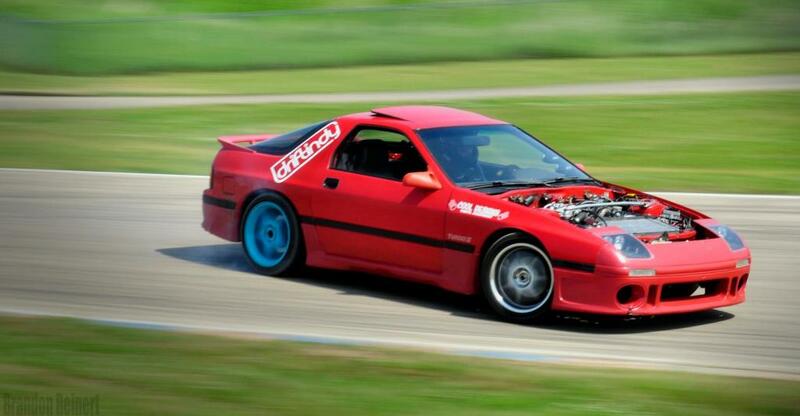 My car of choice was a 1988 Mazda Rx7 Turbo II which had already had an upgraded turbo, standalone, and a few other mods but the motor was blown up. 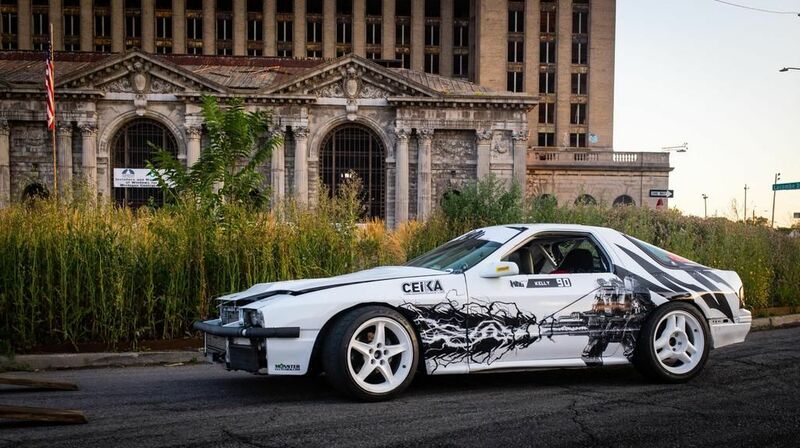 I went with an Rx7, to be Different than the 240sx crowd, and I was personally interested in learning the rotary. 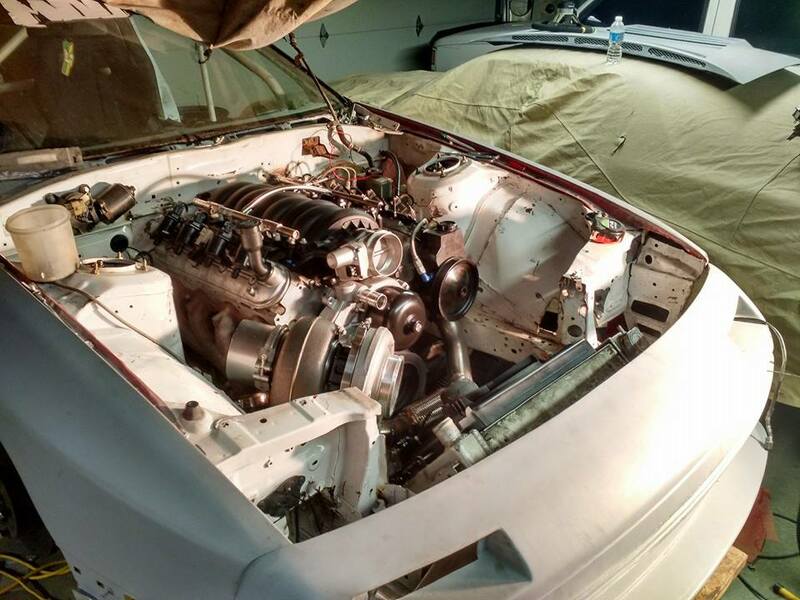 Since this was the first time ever rebuilding a rotary, or for that matter any engine at all. 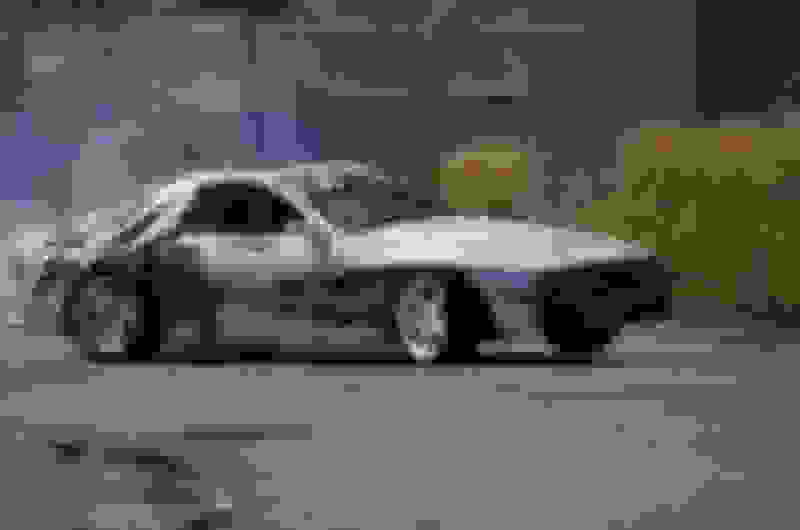 I had general knowledge but was totally new to any in-depth automotive system. Since I was so new I figured I would have someone else build my motor the first time around. 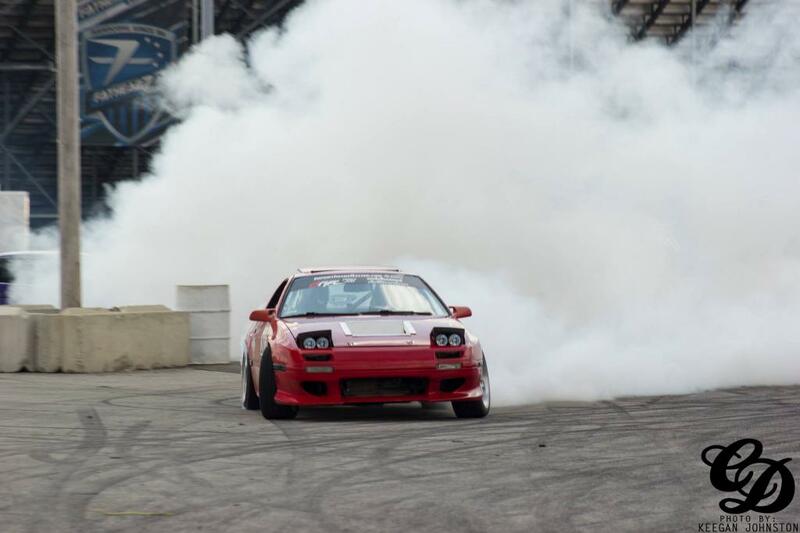 Hit up a local FD driver ( who was also in with rx7's and rotaries) , Mike Feiock or "t2 Mike" to rebuild the motor for me .The motor was getting a street-port as well as series 5 irons, and N/A high compression rotors for the perfect boost build. Mailed the Microtech to AUS to get wiped clean and a new base tune installed. At this point I had already missed the event I registered for. Kept in it, got the microtech back and was so excited to finally go tune. Despite my tuner (also Mike Feiock) noticing a few noob mistakes, we were able to get a solid base tune, and man did the car felt great. 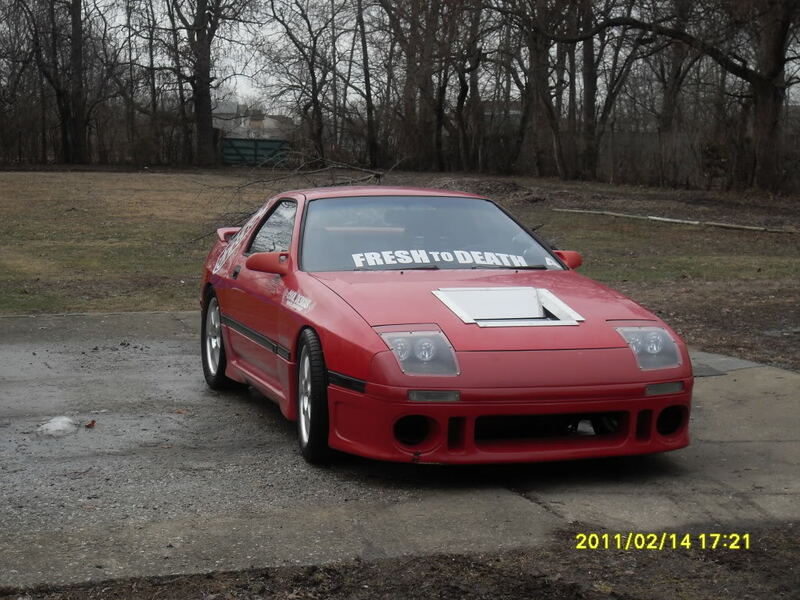 At the time this was the fastest thing I had ever driven I was the happiest kid around. Drove 10 hours (because Chicago traffic) to Midwest No Star Bash 2012 an event in Shawano Wisconsin at USAIR a super crazy rollercoaster go-cart track. 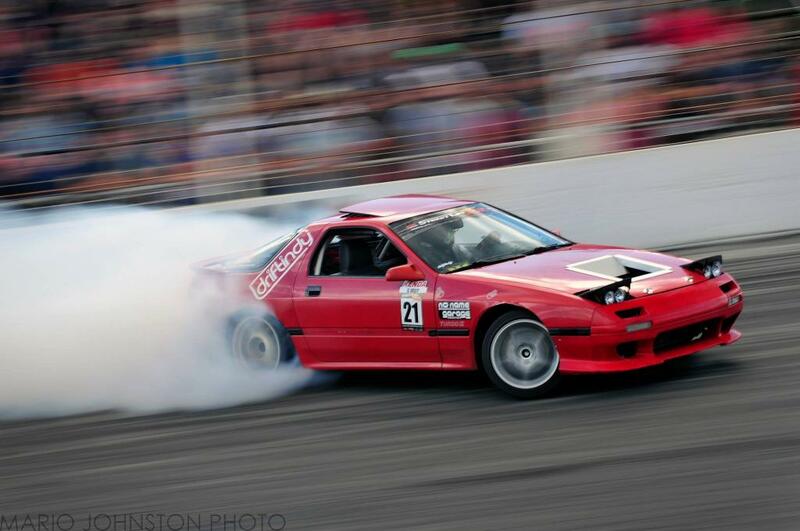 This was the very first time ever drifting this car and I was super stoked on how it went. We started off on a skid-pad with a pass or "keep trying" to be able to drive the big track(s) so I was nervous as dicks. Heres some video of my first time driving this car. Car had great power just had to learn how to apply my carting skills to having three pedals and a 2000lb vehicle. 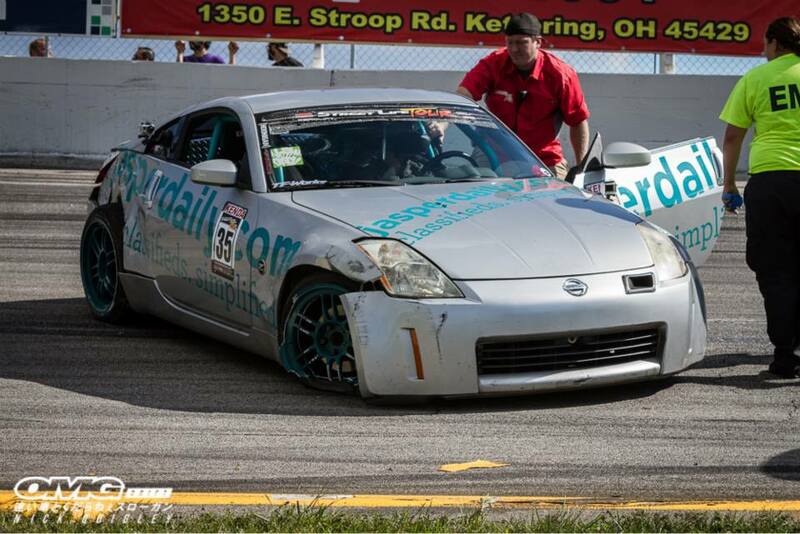 Finally graduated from the skid-pad after a few more runs and onto the big track we went! The track felt super natural and that car was starting to feel great. It made for a great event and high hopes for the future! The next dream was to drive a Midwest Drift Union Pro-AM Event. 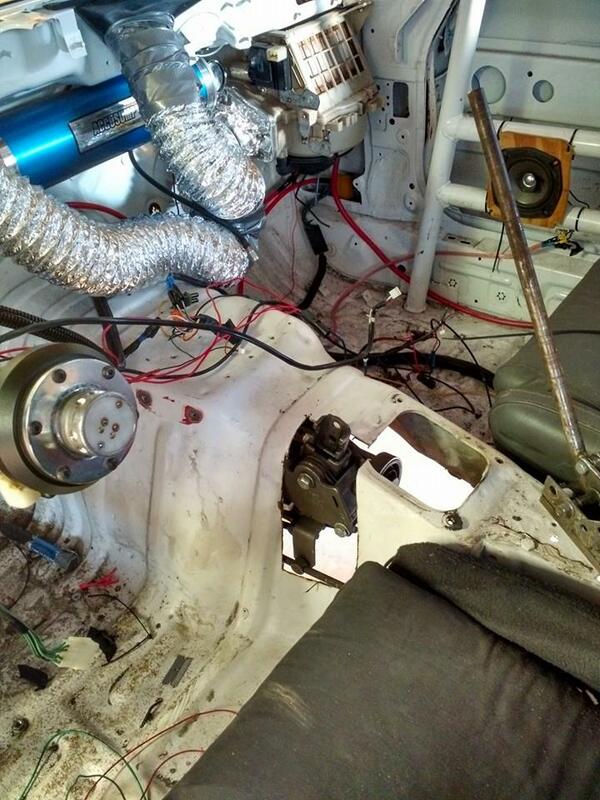 To do this I needed a roll cage. 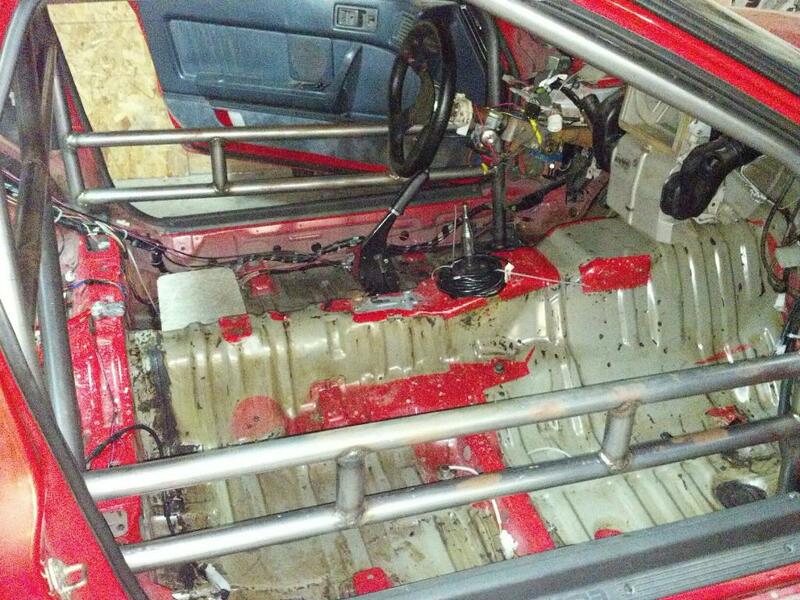 Roll cage installed, and I was onto my first Pro-Am Event. 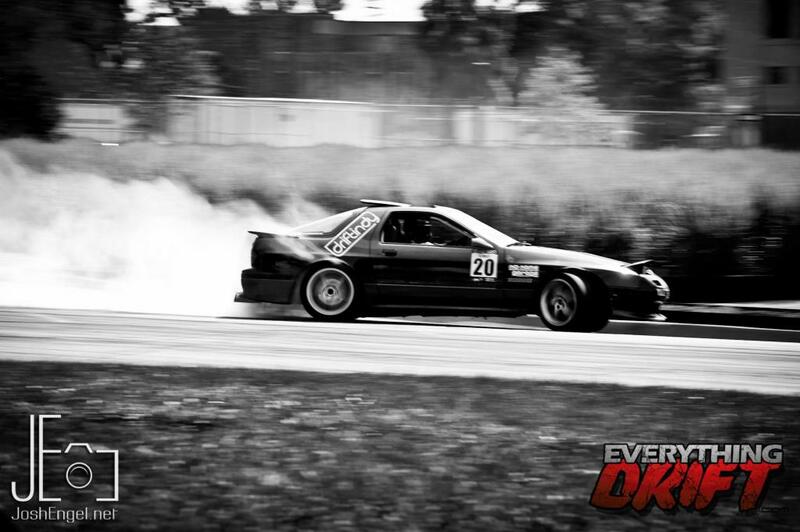 Midwest Drift union 2012 Round 3. Did horrible at this event. I went from feeling good to feeling bad. Don't even have videos. Was a joke. E-Fan ran down battery. Car kept dying idling in grid. Had to push start. Was the very last car to do qualifying runs. Was not in a good mental state, didn't make top 16. At the end of 2012 Mike Feiock convinced me to head down to St.Louis to drive Gateway International- the big boy track. This was my first time driving third gear. I was super nervous but it actually turned out to be an awesome event. 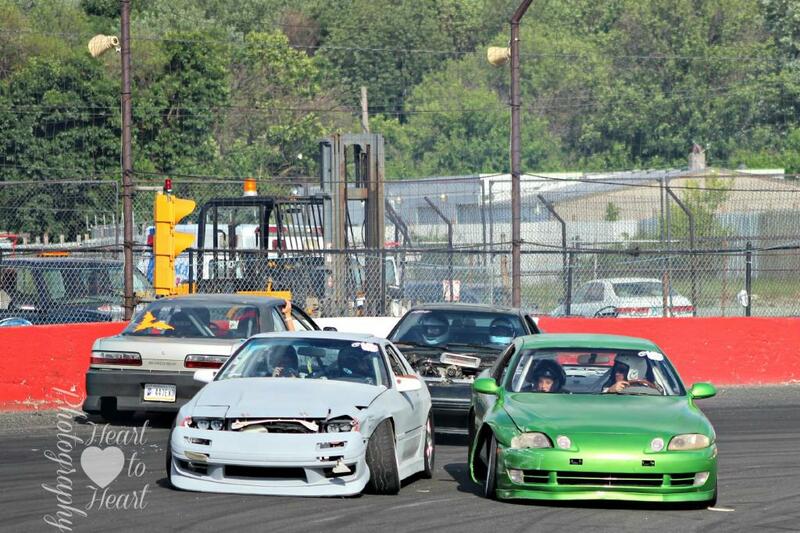 I really learned my car that day and I think that event partially made me what I am today. My first run "linking the course"
Felt super good confidence restored. Was excited going into 2013! 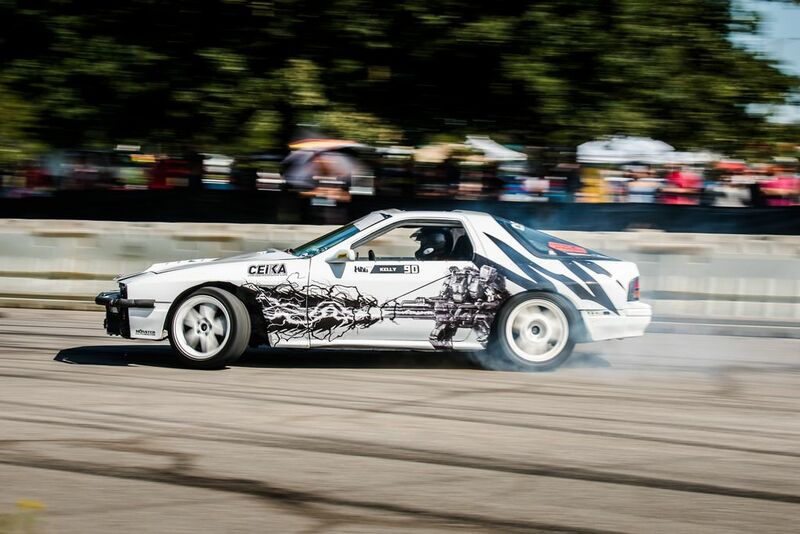 2013 was here and it was time for Round 1 of the Midwest Drift Union. First time running a bank, high speed entry, e-brake didn't work. Was much needed. Only linked the course a couple times during practice, but my family was there so I threw it all in. Waited patiently as they announced top 16. Turns out they gave me a score placing me in 17th. One spot out of top 16. Round 2 2013 was back at Gateway International in St. Louis I was feeling so good going back to a track that I already knew. At this time I had rebuilt my motor (myself) redid my fuel system to support e-85 as well as upgraded to a GT-35R turbo knockoff. The cars power was insane better that it had ever felt, and going to the fastest track of the circuit I couldn't be happier. At this event I got my first real tandem practice, and I loved it. Followed one of the fastest cars, and one of the top drivers of the series. My first real driving experience against an LS car. 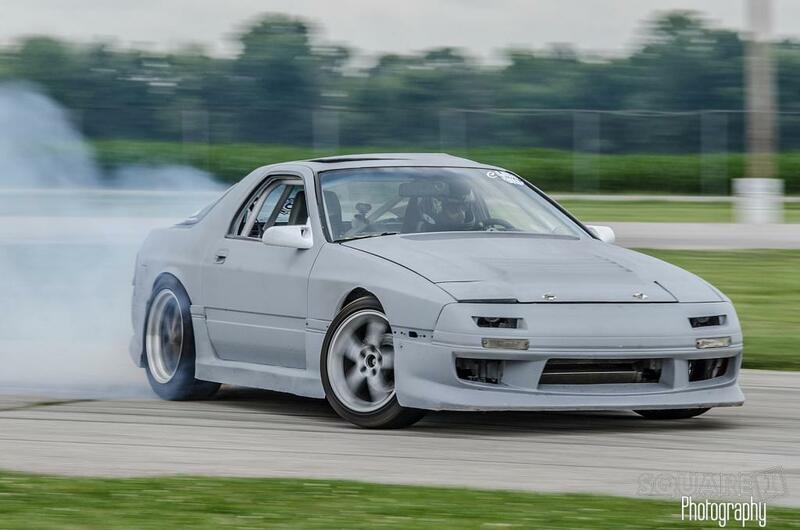 Ended up with a qualifying run that landed me in 14th pairing me with the 3rd place qualifier Brian Peter who is an ex FD driver with a 700hp Rx7. First time in top16! Super excited didn't expect to beat Brian but was excited to put on a show. My buddy kept telling me not to let his car get an inch on me off the line, but it was expected with him having such a HP advantage. Because his car was so much faster he did gap me slightly and in my haste to catch up I pushed super hard into the first turn, washing out slightly with big angle while he held tight to the apex and immediately gapped me. Second round I blew a coupler. Straightened event was super rad though. Love the setup. 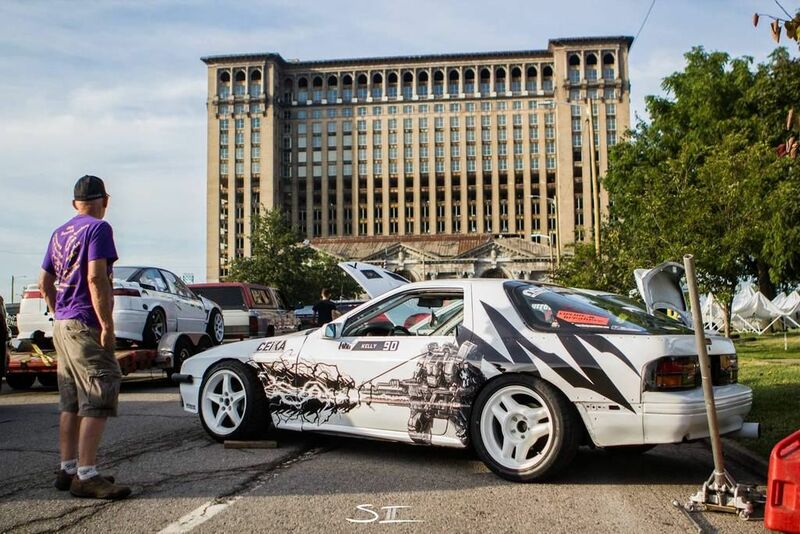 Round 3 2013 Streets of Detroit. 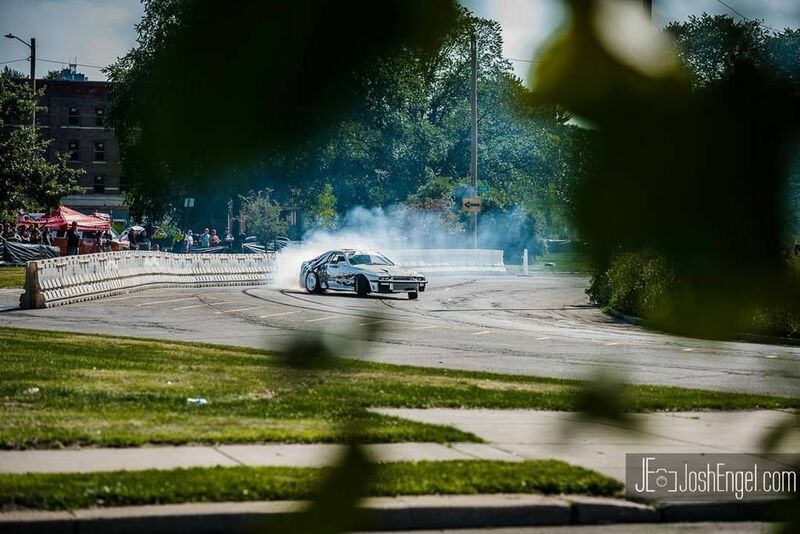 Another event in the Midwest Drift Union Series, this track setup was on the streets and it made for great pictures. Felt great all day did some killer runs with a lot of people. 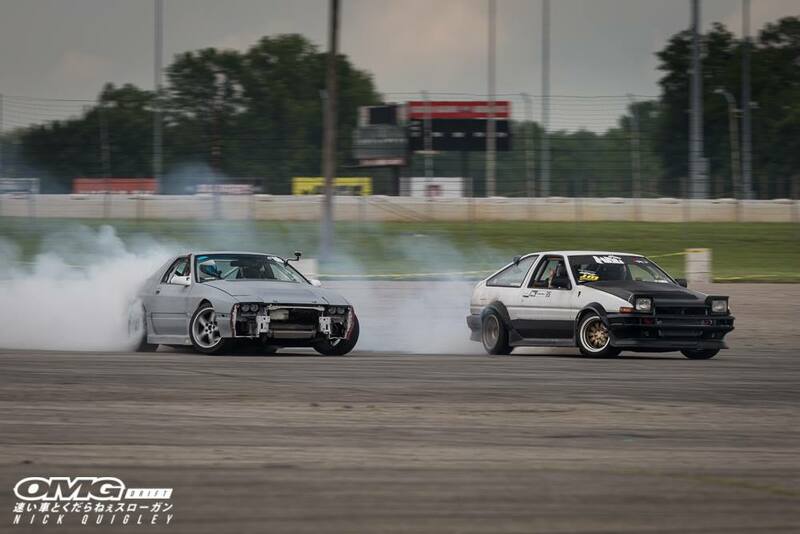 I ended up qualifying 11th and went against a buddy of mine Michael Tung from Team Breaking in his Blue SR20 Hachi. He ended up beating me because I tried to run, but we put on a show. Round 5 STREET LIFE TOUR!!! 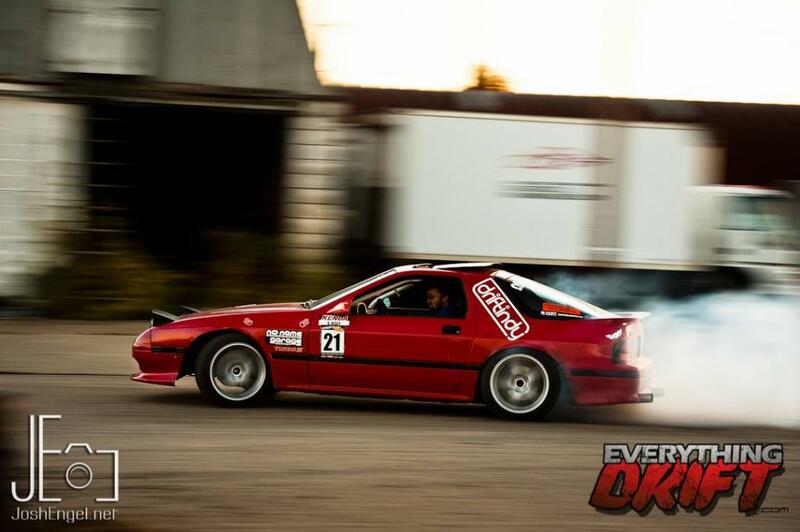 one of the biggest point of my years of drifting. The biggest event of the Midwest. The event where Jarod DeAnda announces, and 5,000 people attend. The one I came and watched as a spectator wishing I was a driver, and now it was my time. This was Kilkare Speedway. 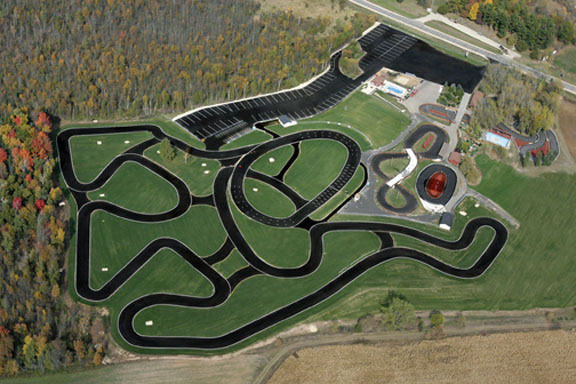 The track that drivers joked was Kil-Car speedway. Throughout the day my shifting was getting worse and worse. My shifter bushing was failing, but I was still able to throw down some pretty satisfying practice runs. I pulled my shifter out and nothing but pits of plastic remained in the whole. My bushings were gone, my shifter was 7/16th ball in a 9/16th hole. Such slop. But a nickname was about to be born. That qualifying run was one of my most perfect runs of all time................ except the part where I dropped 2 tires and didn't qualify. Second run I couldn't even get it in gear. That was all I got. I didn't care. I was so happy that I threw that run down even if I didnt make it. Everyone loved it. That was all that car had. Every ~450hp of my e-85 fueled rotary. I remember pushing so hard on the throttle I was pinning myself into my seat because I wanted more. Another view of it? Sure. There was much more to my 2013 year than what I have said. I drove 4 or so practice fun events. Rebuilt my motor about 4 times and learned so much along the way. 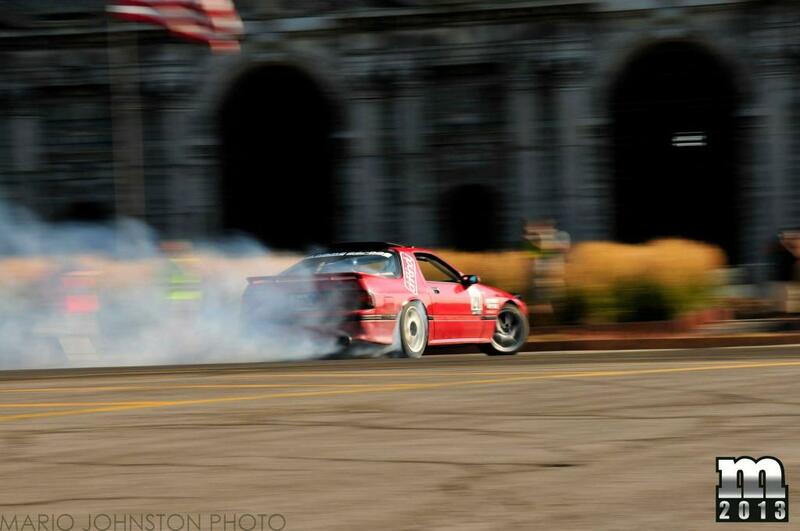 My very final event before I tore the car down and painted it was The Dangerzone a private industrial park in Ohio. I was invited out by the owner and a friend to come and rip at this dreamland. Great hopes for this year to be awesome were shattered with my s5 irons cracking when tuning for more power at the very begging of the season. Without the funds to rebuild the engine I was forced to try and make do with what I had which was a very time consuming process. This involved taking the motor in and out of the car 10 times in a month, and apart 4 times, trying different things to stop the oil leak that the cracked iron had created. Only to find out that it wouldn't work at all and we just had to start over. Before getting this far we had painted the car primer grey with hopes to paint it fully white, and essentially got rid of all remaining red on the car. We also installed an origin body kit. 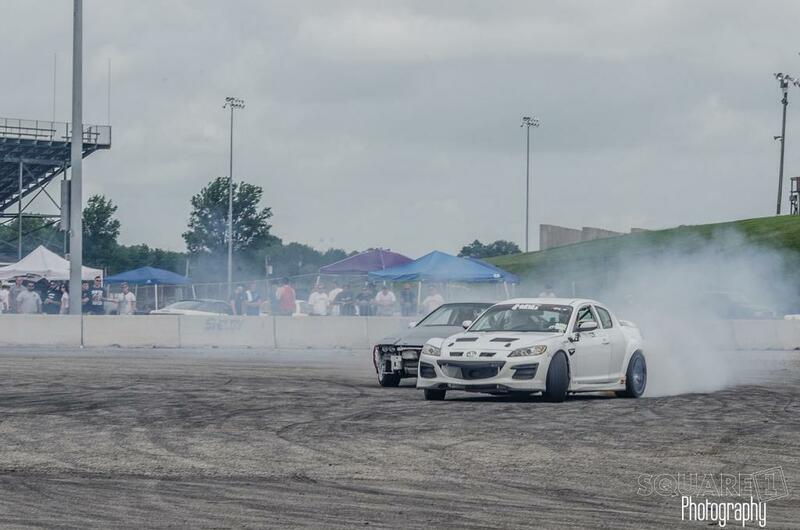 First event of 2014 was Midwest No Star Bash, we had a lot of good media, tandem practice and were loving the new suspension setup! 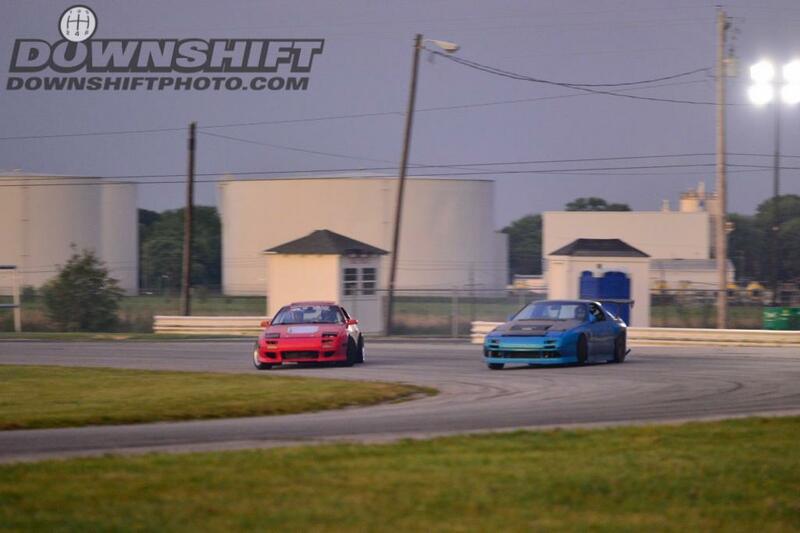 Awesome tandems with friends. So relaxing to be at a non competitive event. 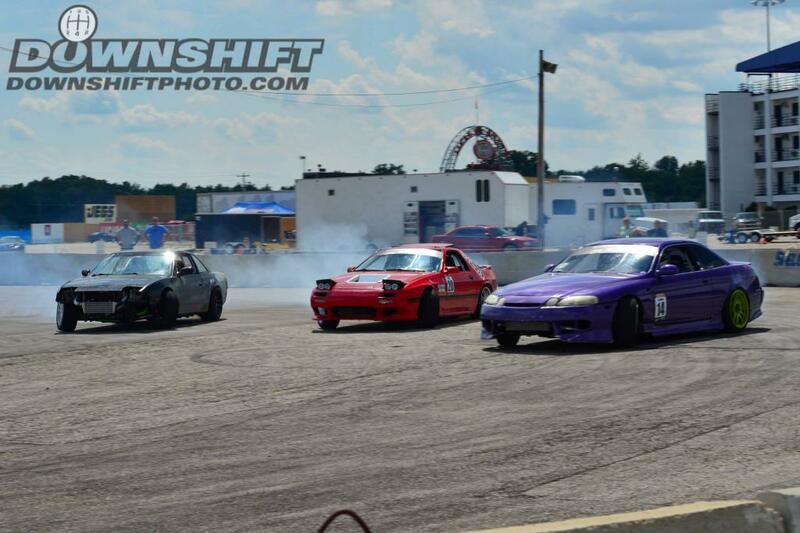 Next event was another practice event at a figure 8 style oval track. 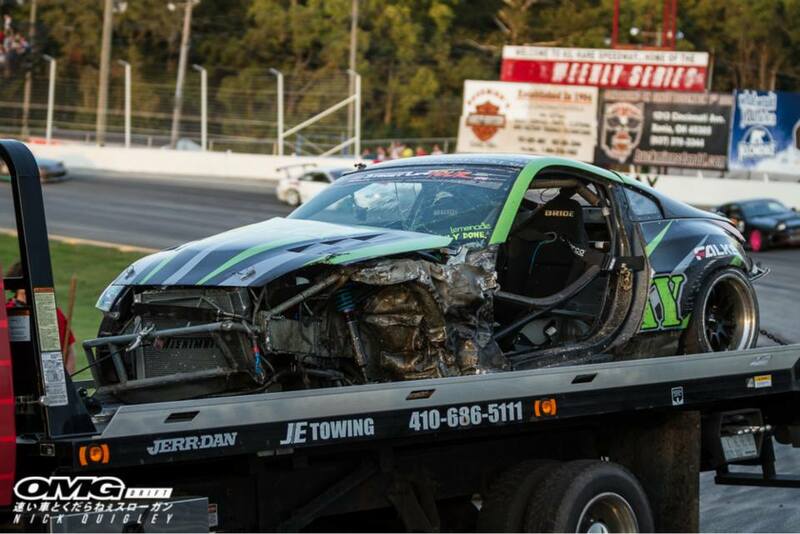 This was a very fun event that ended in a bang when I was in a 3 car pileup. Some run videos from before earlier in the day. I have several reasons for doing what I did in the crash, such as not really avoiding it. But I'll save my fingers. There are actually two hits. One from me hitting the guy infront of me, and the second big one from getting hit by a 4000lb Lexus. There is no outside view. Just a picture. One month to fix a few cosmetic things and suspension pieces. Plus my frame was pushed in 6 inches. A come along and about 5 cars as anchors and we got it back pretty right. ( I have a picture somewhere). Event time, had to use my old suspension from 2013 since my stuff got bent. Was excited and a little bit more nervous then I wanted to be. 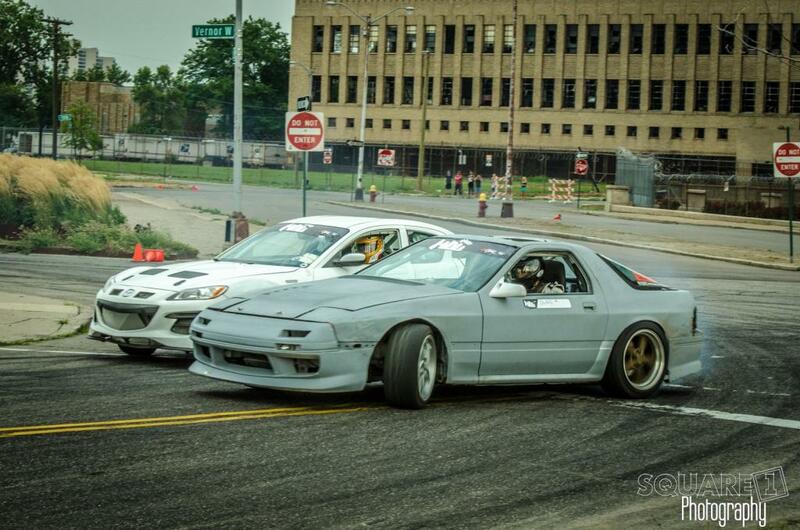 Car felt bad all day, still managed to qualify 14th, where I went against my ex pro buddy Mike Feiock. Unbelievably, he straightened thinking I was going to hit him :/ and I got the win! But not before he put on a killer follow run on me. We moved on to face the big goat GTO of Shane Whalley. It was a fun battle but he ended up getting the win putting me in 8th for the round. Another event, where I lost but wasn't disappointed. I took a broken car and made it work. I was happy, but my strive for more, my lust for better intensified. I gave in. I threw in the towel. I was tired of dealing with cars with far more horsepower than me, and a rotary car with my budget would never truly be where I wanted it. 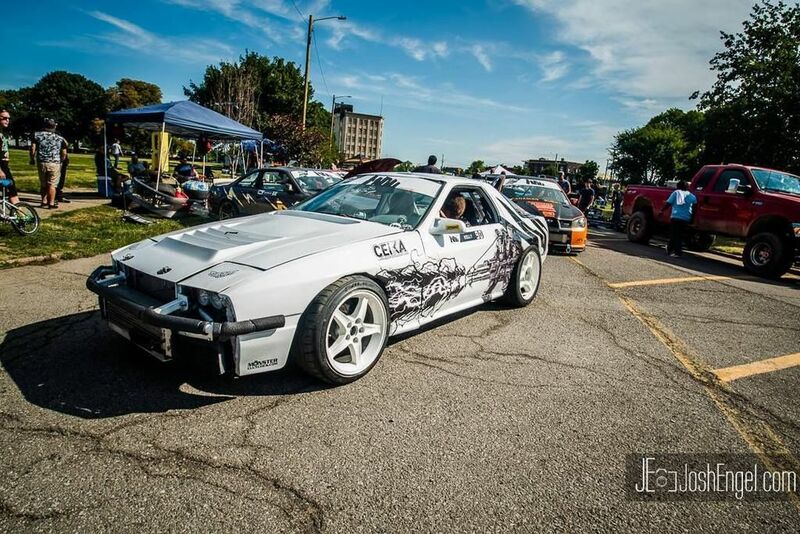 That was my last event for 2014, I sold my motor and moved on. Last edited by stuwk; 02-11-2015 at 10:55 AM. A post I gave to my friends about 2015. When I was 17 I had been researching what engine I wanted to use and the idea of being slightly different lead me to the Mazda Rotary. In 4 years of building, learning(breaking), experimenting, I had developed the sweet smelling, stupid loud, badly tuned rotary that we had all come to love. Because the quest for "more" is a part of our lives. It's what gets us up every day. The idea that we want something better. 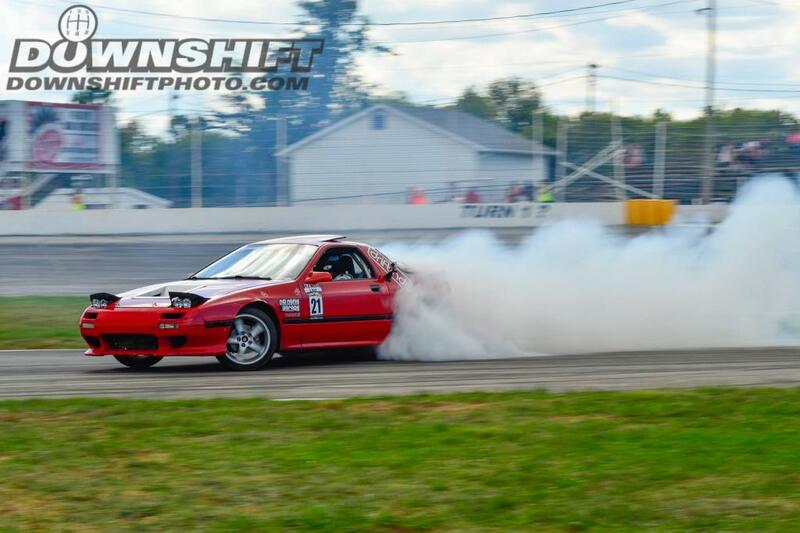 Get a 13REW (Third gen Rx7 Motor) they said. It will hold more power without breaking. Finding a 13BREW in decent shape for my budget would not have been easy. And it still would not have been enough for the "More" that I crave. Get a 20B they said. 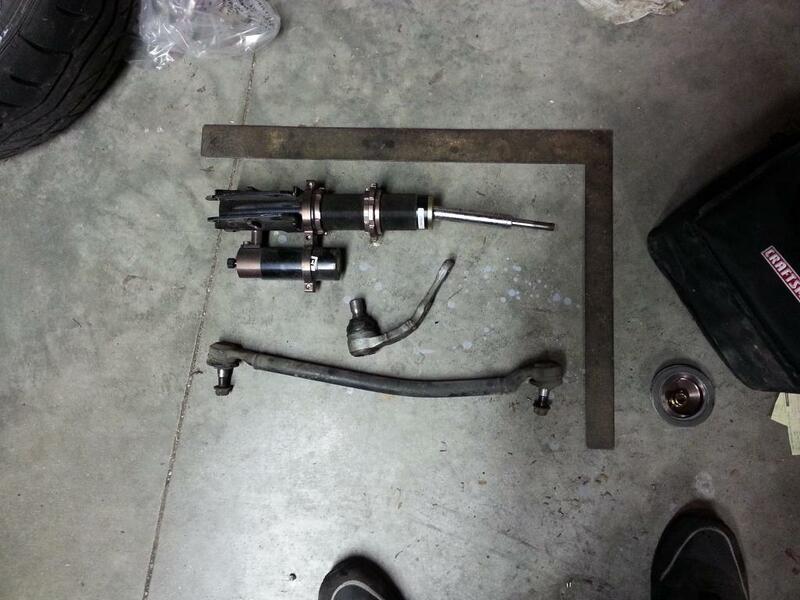 You will have another rotor and more displacement. Great idea....lets add 1.5x the cost of repair and 2x the cost to start. It would have been "enough", but for how long? 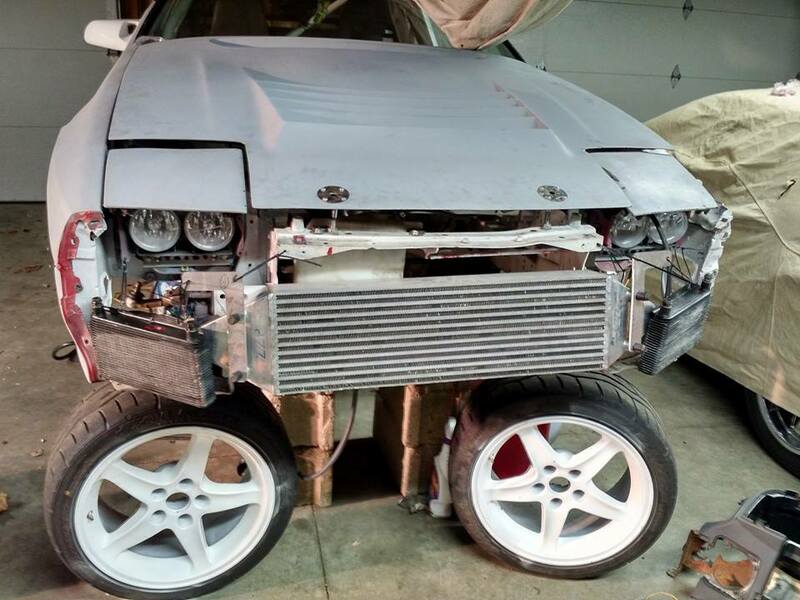 Get a 2jz they said. It will solve all your problems. It would have been "enough", but the cost to build to reach my goal, and the weight of the engine did not stand out in my sea of options. Get an LS they said. Everyone's doing it, it's cheap, reliable, light if aluminum, will support power, easy parts, common knowledge, and oh yea.... I work for an American Auto parts company. Everyone has it. One of the only negatives that I can say when comparing it to my other choices. There's a reason for this. We live in America, it is what it is. I'm still black. Kind of. 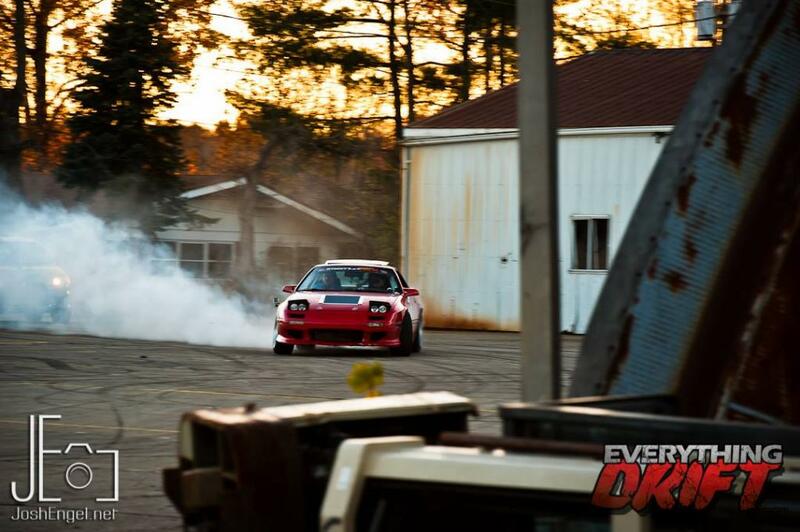 I know I have a ton of rotary fans, and let me remind you my daily and my missile car is still rotary. I have not given up on these engines, they are still a hobby of mine. 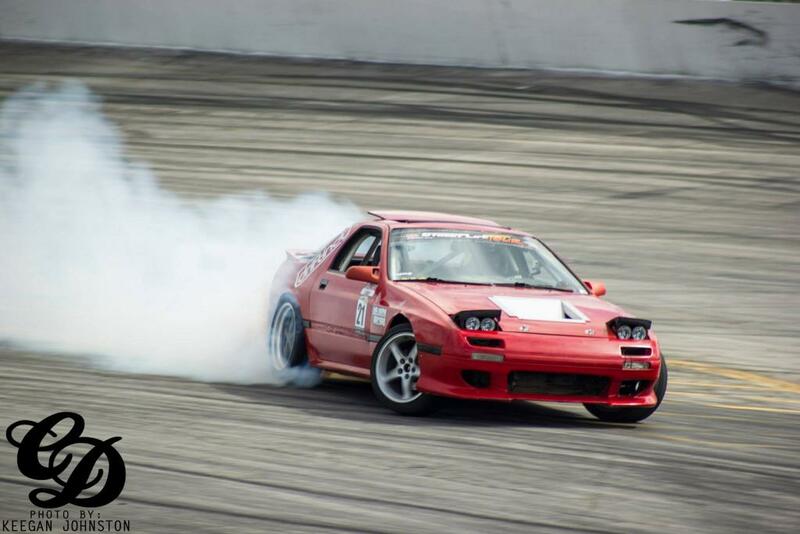 With the progression of drifting and the quest for more horsepower they are simply not cost effective for ME with anything other than grassroots drifting. I do however believe that they are a great learning tool for any entry level Motorsport and encourage anyone starting off to give it a try and see if you get hooked on these little awesome engines. Some of you know how much time and effort I put into keeping my car at 400hp for the past seasons, and I think you will understand. 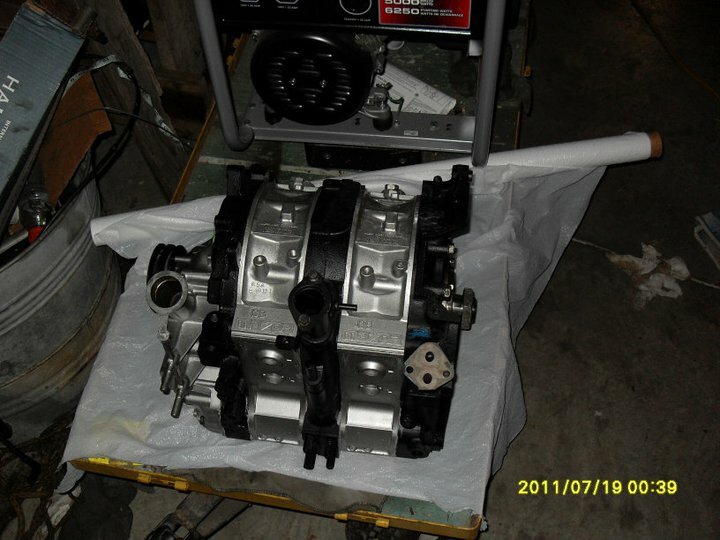 ------A few months ago I picked up a L33( Aluminum 5.3 LS truck motor). 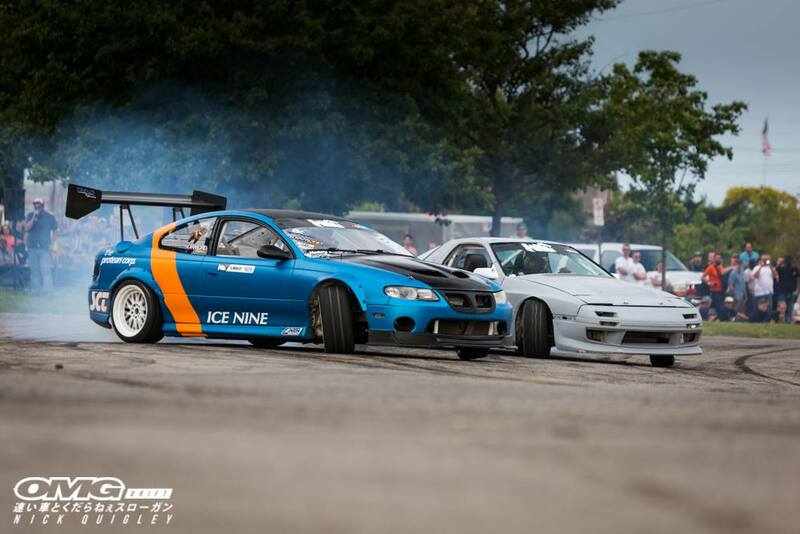 Super Street 4+1 behind it back to a Ford 8.8 IRS style rear end. This isn't another kids project that won't get finished. I nearly have everything I need. 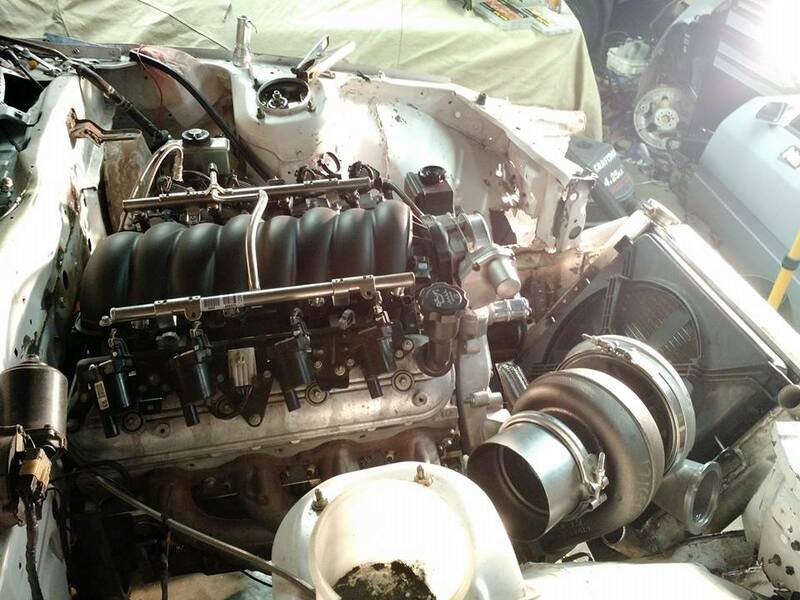 This is my dream to have great reliable power without worrying about my engines condition after every event. Support me in this and it will be rad. P.S Brian Peter....I'm coming for you. 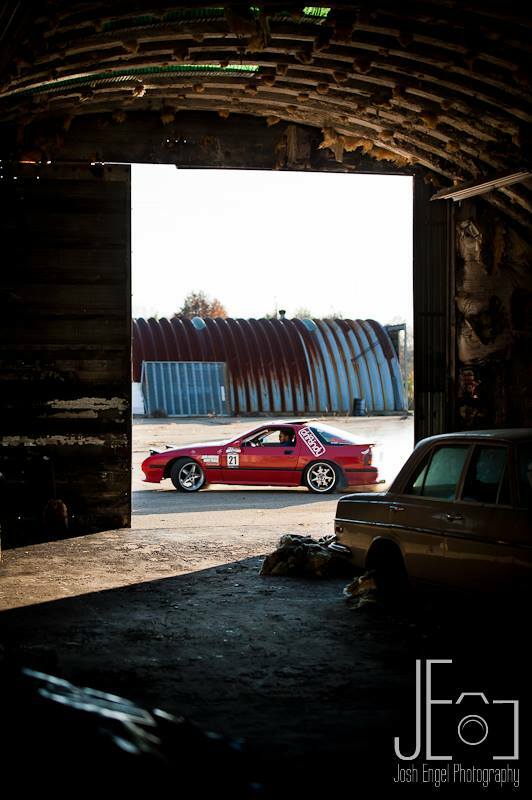 [IMG] When I was 17 I had been researching what engine I wanted to use and the idea of being slightly different lead me to the Mazda Rotary. In 4 years of building, learning(breaking), experimenting, I had developed the sweet smelling, stupid loud, badly tuned rotary that we had all come to love. If anyone wants to bash me on anything I have or haven't already said...the comments are below and this is a free world. I will answer any questions as best I can. Give me page a like for more updates on this build and my story! Awesome and inspirational story! 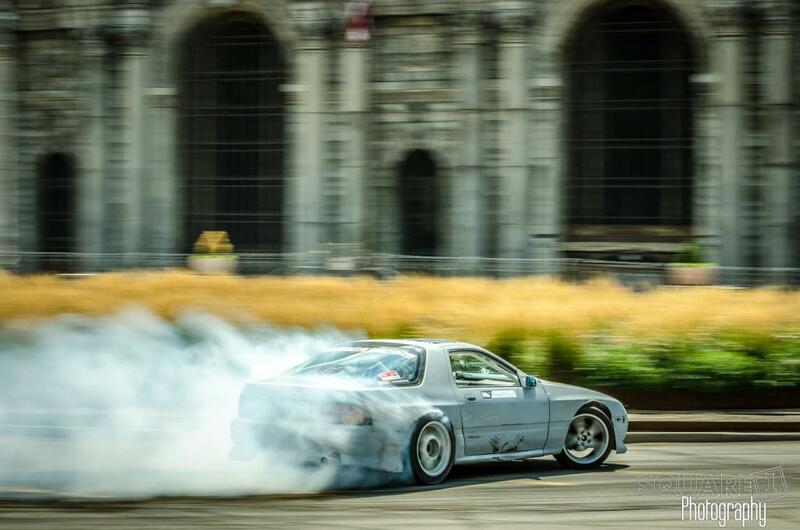 I too have an rx7 for a drift car. Still in the process of making it run. But hopefully after all these sleepless nights ill get it ready for the track. Thank you for sharing your achievemets! And good luck with the ls1 looks great! 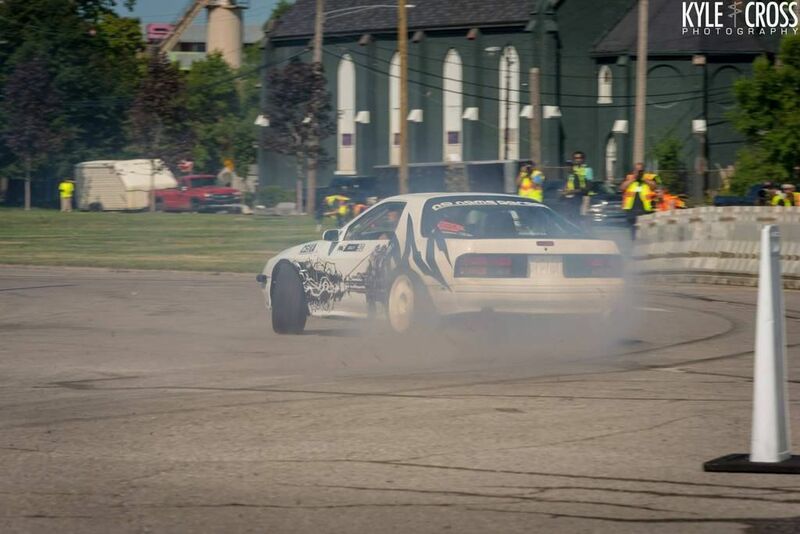 Went to Detroit Michigan for Round 2 of the Midwest Drift Union series in hopes of continuing my points in the championship. Between my last event and the upcoming round 2 I had finally had the time and money to complete my car design which had been a dream of mine for several years. 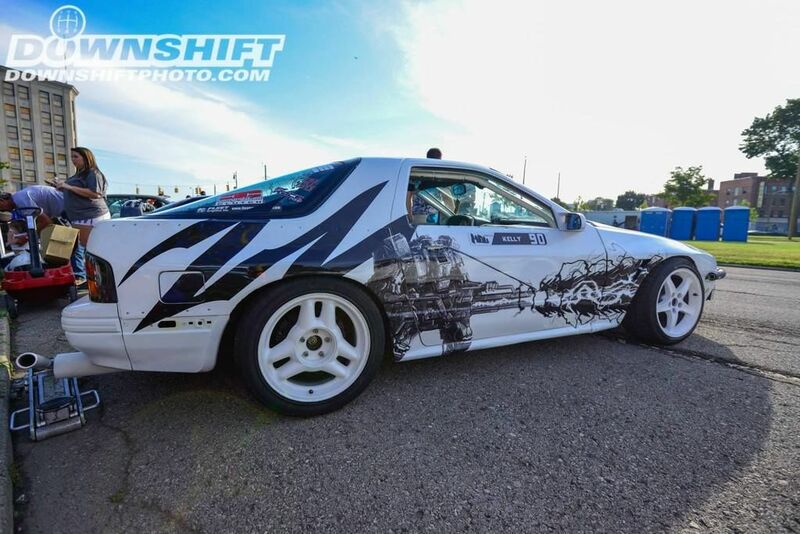 Seeing my design come to life on the car was an amazing feeling and I couldn't wait to show it to everyone. Unfortunately on my third run of the first practice session I broke the stock mazda outer CV axles on my Ford 8.8 conversion. Although I was only able to put on three runs the car was feeling amazing in power and I was able to get some great media from the event.